Designed for the temporary prevention of suspension trauma, the Relief Step is adaptable to any full body harness. Compact pack encompassing a webbing strap and foot loop. Attaches easily to ANY full body harness. Assists in allowing circulation until rescue occurs. Pull tab to deploy, and adjust length of foot loop. Two Relief Steps are recommended (one for each leg) for added comfort, balance and better circulation in both legs. Stretcher options to suit any environmental application from rough terrain to vertical rescues. Alphin Lite stretcher with rigid frame and polypropylene bed folds down for easy storage and is suited to difficult access areas. Evac body splint becomes rigid when wrapped around the casualty and can be lifted vertically or horizontally. Rolls up for easy storage. Basket stretcher has welded framework and a wooden surface, it is versatile and ideal for winching applications. 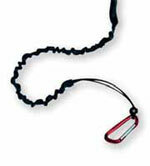 Tool lanyard conveniently attaches to the users belt. Tool attachment via small karabiner or adjustable clinching cord. Elasticised cord for greater worker flexibility. 800mm retracted and 1.2m fully extended. Lightweight webbing with cord one end for tool attachment. Adjustable wrist strap other end for connection to user. 1.1m in length and a maximum tool weight of 5kg. Sports carry bag for easy transportation of PPE. Heavy duty double zip top. Perfect for keeping kits and equipment together.